Hampton Court House was built in 1757 by George Montagu Dunk, 2nd Earl of Halifax, Ranger of Bushy Park and Chief Steward of the Honor and Manor of Hampton Court. In 1767 a further 3 acres of ground was added so that the house and grounds now occupy about 8 acres of what was originally part of Hampton Court Green. A Grotto this, by Mortal Hand! It dazzles, while it charms the sight. South of the pond, between the grotto and the house was an octagonal gothic hut, raised on a mound and attributed to Wright (now converted to a garden room). Sometimes described as an ice-house, it has a similar form of shell decoration. By the end of the 19th century it had been converted into a garden room (complete with fireplace). Hampton Court House was actually built, to designs by Thomas Wright, for Anne Maria Donaldson, mistress of George Montagu Dunk, second Earl of Halifax (1716-1771). 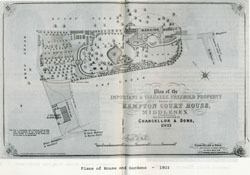 The layout of the grounds is attributed to Thomas Wright between 1757 and 1769. Seventy metres west of the house is a pond, originally heart-shaped. 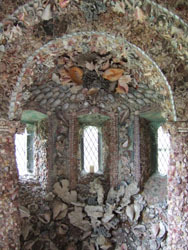 Against the south boundary of the grounds is a remarkable grotto (now known as the Shell Grotto) by Wright, restored in 1856 and 1983-6. The grotto is built into a mound. It has an arched entrance and two side wings. 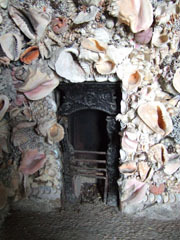 It is decorated with large shells, glass, coloured rocks and bark. 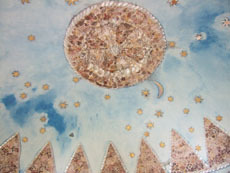 The ceiling was painted blue with gilded wooden stars. 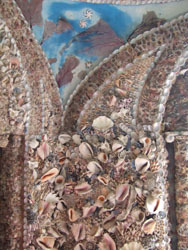 The restoration of the Shell Grotto, completed in 1986 was carried out by Diana Reynell. The costs for the work to the structure which had been upgraded to Grade 2* were met by Richmond Council and English Heritage. The house has been occupied since 2001 by Hampton Court House School.